UK manufactured steel door available in a range of colours. Unlike lower quality doors which are available on-line which are often secured by small latch clips and cables these doors feature a Night Latch and large, strong top and bottom shoot bolts on the inside which lock into the floor and frame top. This door also comes with an overlap which helps prevent forced entry by kicking the doors inwards as well as pulling them open. 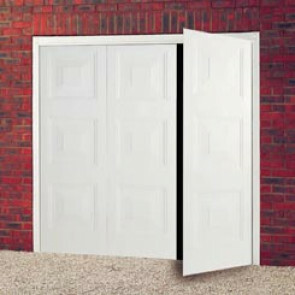 Side hinged garage doors are available in the same range of materials as the up and over range (Steel, Timber and GRP). They are popular ‘traditional’ looking doors and ideal if there are obstructions in the garage. They feature excellent security and the construction is very durable. All our garage doors, unless otherwise stated, come complete with lock/handle/fitting pack and full instructions. Sizes given are for the doors only excluding the frame and the measurements are given Width x Height. We recommend you order the door with the matching steel 50mm either side (50mm on the head) for ease of fitting. On a 2/3, 1/3 door you can request left hand opening for £50 extra. Cardale is part of the largest garage door company in the world, therefore, you can be sure that you are not only getting a high quality product but the manufacturer is strong in its market and very unlikely to go extinct as some manufacturers have over the last few years. This means that your warranties will remain valid and you can obtain any parts that you may require at a later date easily and well into the foreseeable future. The steel doors that we sell are constructed using premium grade galvanised steel making them both secure and corrosion resistant. We have the largest range of finishes available for these doors including powder coated solid colours. The doors are manufactured in Britain and have unique deep pressed panels giving a high level of panel detail. This particular door comes complete with a Night Latch. Complete with door stays to prevent the doors opening further than 110 degree and blowing into the opening. Overlap to prevent forced entry.